List of Contributors. Introduction to the series: an editor's foreword (A. Padwa). Preface (L.H. Hurley). Part I: Methods used to evaluate sequence specificity of DNA reactive compounds. Application of equilibrium binding methods to elucidate the sequence specificity of antibiotic binding to DNA (J.B. Chaires). Quantitative aspects of DNASE 1+ footprinting (J.Goodisman, J.C. Dabrowiak). Use of circular dichroism to probe DNA structure and drug binding to DNA (C. Zimmer, G. Luck). NMR analysis of reversible nucleic acid-small molecule complexes (W.D. Wilson et al.). Use of enzymatic and chemical probes to determine the effect of drug binding on local DNA structure (K.R. Fox). Part II: Sequence specificity of drugs that interact with DNA in the minor groove. The DNA sequence selectivity of CC-1065 (M.A. Warpehoski). Mitomycin C: DNA sequence specificity of a natural DNA cross-linking agent (M. Tomasz). Sequence specificity of the pyrrolo(1,4)benzodiazepines (J.A. Mountzouris, L.H. Hurley). Calicheamicin/esperamicin (G. Ellestad et al.). DNA sequence controls mechanism of oxidative deoxyribose damage by neocarzinostatin (I.H. Goldberg). Index. 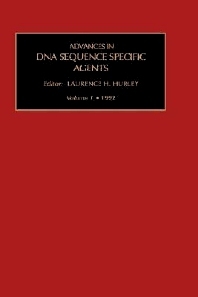 This volume is aimed in general at scientists who have an interest in deciphering the molecular mechanisms for sequence recognition of DNA. The methods have general applicability to small molecules as well as oligomers and proteins, while the examples provide general principles involved in sequence recognition. For scientists and researchers in the field of DNA sequenencing.